Ok, so I lied. I thought my trip to Puerto Vallarta would be the last time I flew Delta when it was in Terminal 5 in Los Angeles, but plans changed. We had a Cranky Concierge meeting in Phoenix, and I decided to take my wife earlier so she could have a relaxing birthday weekend. We flew Delta out, and it didn’t go well at all. There were so many self-inflicted mistakes that it became downright comical. The 2.5 hour delay never should have happened. You might wonder why I didn’t fly Southwest out. After all, I have that companion pass which should make it cheap. But the schedules to Phoenix leave a lot to be desired these days. Southwest had nothing between 12:40pm and 4:15pm and we wanted to leave after the kids got home from school but get in so we could still enjoy a little afternoon pool time before dinner. Southwest just wasn’t going to work. Besides, it was going to be $250 for us to fly them ($125 a person with the pass) when we could get Delta for $180 each at the time we wanted. For only $50 more a person, it wasn’t worth it to change our schedule. I checked in on my phone and was ready to go when I got a call in the morning from Delta. The airplane had been downgauged from an Embraer 175 to a 170 so they wanted volunteers to go at 9pm that night for a $300 voucher. With the aircraft changing, I wondered if we’d be delayed and my decision would be easier. But I looked and the new airplane had been in LA since the night before. I turned down the bump. We got the airport an hour before departure and we were flying out of Terminal 6. So hey, maybe that last trip was my last time flying Delta from Terminal 5. I walked by the temporary Delta ticket counter there (above) on my way to an empty security line before walking to the gate. You can’t see through the windows at this end of the terminal, so I assumed the airplane was ready and waiting for our 2:40pm departure. We just took a seat. There were several announcements asking for volunteers. They had upped the ante to $600 each and I was tempted, but we stuck with the plan. A few minutes later, the captain of our flight stepped up to the podium and told everyone he called operations and was told that our airplane was scheduled to be towed next. He apologized, told us a little more about the flight, and assured us the crew was ready to go. That was very well done, and he kept this up throughout the flight. Kudos to him. Our original departure time came and went, and there was absolutely no update on the Delta website. It still showed us going on time well after scheduled departure. The gate agent gave us another update saying that the airplane still wasn’t there. She sounded frustrated and was apologetic. Time kept slipping. At 2:56pm Delta finally updated its system to show a delay… until 3pm. We still had no airplane so that was laughable (and probably just an auto-update that only serves to make people angrier with its inaccuracy). Then the rolling delays kicked into gear. At 3pm, it showed a 3:15pm departure. A little after 3pm, our airplane finally arrived. This airplane had been sitting in LA since the night before, but it needed to be cleaned. (Is that not something that could have been done previously?) Catering also had to come onboard. Around 3:25pm, Delta updated the departure time to 3:30pm. Yeah right. But at 3:30pm, it pushed to an oddly-specific 4:14pm departure. Then the announcement came at 3:35pm. A couple minutes later, our fearless captain came on again to give us a more detailed explanation. He said the airplane was supposed to go to Dallas that morning and they fueled it for that. But since we were only going to Phoenix, we would be overweight by the time we landed there, so they had to remove 3,800 pounds of fuel. And then, in an “Airplane!-esque” moment, he said, there’s more bad news…. I expected to hear that they were out of coffee, but nay. The air conditioning didn’t work, so it was “a bit warm” on the airplane. You could tell he was frustrated by all this as well, as you’d expect. At this point, I could only laugh at the level of disorganization. I also wanted to kick myself for not taking the bump earlier. There was a 4:30pm flight out of Long Beach on American that we could have paid $190 for. That ended up arriving more than an hour before we did. I turned to the bar in the middle of the terminal hoping to watch some March Madness, but the lone TV inexplicably had Judge Judy on instead. At 4:05pm, the captain came back and told us that the truck they were using to pull fuel off the airplane was full and they needed to find another one. It would be about 10 minutes before one showed up. In better news, the air conditioning was kicking in and it was getting a little cooler. At 4:15pm, the fuel truck arrived and the captain told us that it was still warm onboard but they were going to start boarding us anyway so they could push back as soon as the fuel was pulled off. Onboard it was indeed warm, but it wasn’t awful. I may have felt differently if we had been stuck on the ground for much longer. The agents weren’t aggressive enough at checking bags so people, including my wife, were stuck holding rollaboards all the way in the back and had to swim upstream. Then they made everyone stand with their bags outside the airplane while they tagged them all to be picked up at baggage claim, not planeside. It took several minutes before that cleared up and we were finally ready. The captain gave us a detailed explanation saying we’d push back soon then it would be a 15 to 20 minute taxi to the runway. It looked like the APU was broken, and they had an air-start at the gate. Once the engines were turning, it cooled down quickly. There was a lot of traffic, so we had to wait for the alley to clear before we could push. Then we sat and waited multiple times on our slow journey to the runway. To top it off, a beautiful EVA Cargo 747 went right ahead of us, so when it was our turn, we had to wait awhile for the wake to clear. Twenty four minutes after pushback, we were airborne. Above the clouds, it was a gorgeous day to fly. I was going to work, but instead I stared out those big windows as we passed Palos Verdes, Mt Jacinto, Palm Springs, the Colorado River and descended over the Sonoran Desert. The evening light was just stunning, and the flight was smooth as silk (except for one rather large jolt which I’m blindly guessing was from the wake of another aircraft). We landed from the east at 6:17pm, and I was looking forward to finally being done with this. But wait, we weren’t. We taxied around to Terminal 3 and then… we went to the penalty box. Was someone in our gate? Nope. It was worse than that. And then a couple minutes later. “We managed to get a hold of our operations office, but they tell us it’ll be about 15 minutes, because they’re short-staffed.” It was as if we could hear him shaking his head. This felt like a breaking point. A loud groan/yell was let out by many of the passengers, and understandably so. I could only laugh, really, at the absurdity of it all. A few minutes later, the captain came on again and said he told operations he wanted a complaint resolution agent at the gate so they could listen to our concerns. In the meantime, I watched the sun slowly set out the window. It was quite the stunning view. At the top of the jet bridge, there was indeed a Delta red coat agent who was handing out cards that explained to people how to complain. I just laughed and walked away down the long and empty corridor which is clearly going to be changed in the renovation project underway. I thought I had heard that Phoenix had made good progress on Terminal 3’s renovation so I was excited to see it, but I was definitely wrong. It looks like the new security checkpoint is open, but the terminal is still under heavy construction. I’ll have to come back later because the parts that are done (below) look nice. At least my wife’s bag was sitting on the carousel when we got to the claim area. On the way out of the airport, I just couldn’t believe how poorly this had gone. I understand when there are weather delays, maintenance issues, or something truly unexpected. But this was a case of an airline just repeatedly shooting itself in the foot. The crew was ready and so was the airplane. It was just mismanagement of the operation that spiraled into a massive delay. I had been tweeting this all day, and Delta kept responding with fairly generic messages. But after the trip was done, the Twitter team said to DM them my details. I did, and by the end of the night they had sent me and my wife each a $200 voucher for future travel. That was a nice gesture, but I can only hope the others on my flight got the same thing and this wasn’t just favorable treatment to placate me. This won’t prevent me from flying Delta again, of course, but for an airline that is actively touting its operational excellence, this was a big fail. That was a truly miserable experience, sorry to hear you and others had to endure that. My question is, when did ‘Gate Check’ start meaning you’d get your belongings at baggage claim rather than the gate at your destination? I’ve had this experience a few times now with JetBlue and Southwest. The whole point of not checking a bag is to not deal with baggage claim. When a flight crew mishandles the loading of an aircraft people are forced to check their bag and deal with a process they planned to avoid. Not a good experience for anyone involved. This was not a gate check. As on small, commuter planes, you are asked to leave your luggage plane side by a door from which baggage handlers will load it on to the plane. jscheid – I assume that on small airplanes where they do the gate valet, then you get to claim it planeside on landing. But on larger jets like this one where they don’t have gate valet, it goes to the carousel. But I don’t really know, and honestly we didn’t know where to get the bags until we landed and realized nothing was coming up planeside. Wait…isn’t the correct phrase “comity of errors”? “Comedy of Errors” is a reference to one of Shakespeare’s earliest plays, coining the phrase. Comity would make little sense as it implies that either the errors produced some semblance of social harmony rather than farse, or that the errors had something to do with a multi-jurisdictional court system. Anyway, I believe that’s enough deviation from the spirit of the article. Compass-operated Delta Connection flights at LAX seem to have piss poor reliability. I fly LAX-DEN a lot, and I enjoy the E175 cabin and Delta service. But it seems like the punctuality has really taken a hit with Compass and now with the temporary T6 gates. When I flew LAX-DEN a few weeks ago, we had a similar 4-hour long delay, which was prolonged because an Alaska plane was at the gate, and I guess Alaska has priority over them or something? Then at DEN, there was nobody to tow us in for about ten minutes until the pilot make a very sharp and fast turn to go to a gate on the other side of the concourse. On the return trip, not only were we delayed from taking off at DEN because of LAX air traffic, but we also had to park way out at some hangar by Sepulveda and had to be bussed back to T6 European style. I’ve noticed that at least for LAX-DEN on DL, the operator switches to SkyWest beginning next month. Not sure about LAX-PHX. I have not checked to see if SkyWest-operated DL flights have better reliability than Compass, but at least from my anecdotal experience, SkyWest seems to run a better operation than Compass. All of the issues you raise are Delta’s particular usage of gate space in LAX and their operations in general. Compass controls the crew and maintenance. Besides that, it’s all on Delta. Sky West was excellent a month ago from Seattle to Portland (operating for AS). The crew was great, luggage handling was speedy and friendly, and the plane was comfortable. Most importantly, the whole thing went off on time. Charles – I think you’re right. I’m doing a little more research to see how performance has been since the move to T6. I’m thinking that’s the problem, and it’s just going to be a matter of avoiding Delta until after mid-May when the move to T2/3 is done. The Delta press release from Jan. 31 (won’t post a link so as to not get caught in the spam filter) lists flights to and from DEN, PDX, SFO, and SEA as being affected. It doesn’t say anything about PHX, but looking at today’s schedules, most, but not all of the flights to and from PHX are going through T6. So perhaps it is more widespread, but it seems like definitely at least those five destinations are impacted more than others. Does Delta handle Compass MX at LAX, or is it a contracted company? I feel like Delta would’ve been more on top of this if it was their own bird, but instead it was a contract carrier with possibly contract MX. Never a recipe for success. I’ve flown Compass around the east coast (mostly from MSP) and also flying up to Alaska from Seattle, crews were always on par with the friendliest of DL crews and never had any significant delays. Maybe LAX station is an underperformer. I wonder if their AA operation there suffers the same way. Compass has contract and company MX in LAX. The problem is the way Delta over uses their gate space. It’s like a 400lbs man trying to fit into a size Small overcoat. It.Just.Doesn’t.Work. Their AA performance is leaps and bounds better due to the way American operates the “Eagles Nest”. Night and day difference. So much of customer service is about setting realistic expectations and then trying to overdeliver on them. When promises and ETAs are constantly broken like that, it’s frustrating for everyone- especially the crew, as (and correct me if I’m wrong) they’re not getting paid until the plane’s door is closed. Kudos to the captain for doing all in his power to try to advocate for the customers and make things right. I agree, Kilroy. The biggest complaint I have when I travel is lack of communication and mis-information. I also like that the pilot made announcements and seemed as frustrated with the event. However, his use of the words “complaint resolution agent” are incorrect and could confuse those who know what a required complaints resolution official is (someone trained specifically in DOT Part 382 requirements, which address passengers with a disability). 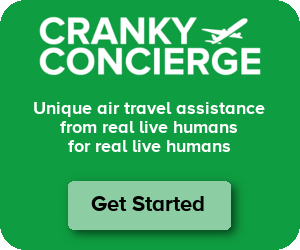 Just showing my many years as a flight attendant where a well-meaning pilot actually makes things more difficult for those of us face-to-face with frustrated passengers. I wish this were an isolated case, but I have experienced this with every airline… United seemed to be the worst, but maybe because I flew them the most? I had a flight cancelled before during a “severe clear” day when the aircraft was taken out of operation for its maintenance checkup-don’t airlines know when this will happen? Anyway, when this is your business, it is surprising how poorly the airlines can operate. In small markets, its definitely a case of “you have no other options”. Good thing you had the time. In days of old you could devote 1/2 day to travel where you needed to go. Now you need a full day. Glad you made it! Hope the rest of your trip went well. I agree with your comment that if you want to be somewhere at a certain time during the day, you have to allot a full day for air travel. Before I retired a few years ago, I flew all over the US and Canada and learned that this was the only way to ensure I had a fairly reliable chance to make it to an appointment on time. Inconvenient? Yes; however business travel is the best because unless you own the company, you’re not traveling on your own time and at your own expense. Flight cancelled because of weather? Well, at least you’re not on the hook for a room and meals! I am frankly astonished that you don’t know the difference between Delta and its regional jet carriers. I could understand if a “regular” passenger didn’t know the difference, but someone in your position should know that your experience was not actually on Delta. It was on another carrier contracted to use Delta’s name and paint job, but operating its own aircraft, crews, and gates. This isn’t something new–it’s been the practice for many years. And no, I don’t work for Delta. “When once you have tasted flight, you will forever walk the earth with eyes turned skyward. I am frankly astonished that you don’t realize that Delta intentionally penalizes the regional carriers’ ontime performance so that mainline will look better. This kind of crummy behavior will continue until the DOT requires carriers to report on a marketing carrier basis. Brett is well aware of the operator, however Delta is the one who controls the gates, the ticket counters, and the ramp at LAX. While Compass is the one flying the plane, they don’t have any control over the logistics at the airport except the towing of the plane – which, may actually be controlled by Delta. I’m sorry but Delta put its name on the side of the aircraft and Delta sold the ticket. Not to mention that Delta is the one in control of its IT system that shows the status of the flight. This is Delta’s mess and they should own it. Claiming it’s by their fault because it was operated by a regional partner is like claiming it’s not their fault because individual employees screwed up and didn’t manaage this in accordance with Delta policy and procedure. It’s Delta’s name and ticket and they own it. You’re spot on. As an employee for a Delta regional carrier who deals with LAX regularly I would have to say that the lack of gate space and the over use of the gates makes for a very frustrating experience on a regular basis. I’d say you’re experience is not the norm but was a “perfect” storm. But delays to and from gates is common and can ruin a perfectly good flight otherwise. This sure was a mess. However at least they communicated with you. The pilot chiming in was a really nice gesture if nothing else. Many airlines would have just kept quiet and had nobody meeting the arrival to get the feedback forms out. Yes, it sucked but it could have sucked a lot more. It is called malfunction junction. Wow! That could have been a United flight out of Toronto!! Flashbacks to my life at UEX. All the time you’d get nonsense like this. I wonder how the plane managed to be at the hangar and also fueled (and therefore dispatched) for a flight it didn’t operate? Perhaps an earlier captain refused to take an airplane without APU to Dallas on a hot day, Compass acquiesced and tried to fix it, but didn’t have time and put it back in to service later? Regardless, if you’re counting on an unscheduled tow crew things are never predictable. Mechanics are rarely so numerous that there are a handful around to reposition an airplane that don’t have something more critical to be doing. Not sure who ground handles Compass in PHX, but it’s also really common for smaller stations to have personnel capacity for one plane at a time. You might need to park, but have to wait for the crew to unload bags from another plane, deliver them to baggage claim, bring out new bags, load, and push the plane before they have time to park you. Such are the wonders of staffing for best case scenario. A few months ago at MSP, I felt a bit like I was in the movie Airplane! This was a DL mainline flight, and the equipment was due in on a tow from the apron. The equipment just hadn’t shown up. The G.A. did a good job of making announcements, but clearly she was as frustrated as the passengers when she’d announce ‘just a few minutes!’ and many more would pass with nothing. Then, a gate change announcement to meet the plane at the next gate, and we’d all move, and then … no tug, no plane. More waiting while she called Ops again. We did eventually get a plane, a crew, and to our destination ,but late and with the cap off that we finally boarded, at gate G5. Whah-whaah! It is the regional carriers to provide information to Delta on their own operations. Delta might control the gates but if other carriers have any part in the process – and defueling their regional carriers’ planes is NOT a Delta function – then you can’t blame DL when regional carriers have problems and can’t keep DL updated. It is valid that the ticket is a Delta ticket. What happened here does happen with other carriers in other cities as well. The terminal switch will provide a lot more space not just for DL but for all other carriers on the south side of LAX. Considering DL has been running an average of 10 flights/day at LAX, there were bound to be problems… but DOT data also shows that DL’s on-time performance at LAX has consistently been better than some of the other big 4 carriers – all of whom have paid the price in operational reliability due to construction at LAX. Ultimately, DL has to say the buck stops w/ them but it is very hard to argue that any one entity or cause was the reason of this or many delays at LAX or the west coast as a whole. its a Compass issue, same thing goes on at American Eagle….Compass on one flight operating for Eagle changed a tire and put the wrong tire on, how does that happen….the flight was well over 2 hrs late and this was just one issue for that flight at the Eagles nest….my friend text me every time something went wrong but like with your issue, the Capt kept everyone informed….every time she has a flight on Compass, there is an issue…is Compass short on crew, trying to operate to many flight with not enough planes, poor aircraft scheduling? MC – I can’t speak to specific issues, but Compass is operating a much better operation for American at LAX right now. There’s something about the Delta operation that’s problematic. “right now” is the operative word. American’s operations, including that of its regional partners, was a disaster at LAX last summer and far worse than any of the other big 4 carriers specifically because they were overscheduling their facility. I am sure you are also aware that all of the weather problems on the west coast this year have really strained everyone’s operations. Given that Alaska dropped to 5th place nationwide in DOT on-time statistics for January and Virgin America was dead last, there is no hiding the operational problems that are taking place on the west coast. LAX doesn’t operate in a vacuum from the region. Delta is spending $1.9 billion on a terminal move and additional gates because it needs the operational flexibility and the ability to grow it lacks right now. Other people face some of the same and worse situations as you face. Your blog just helps shine the light on your experiences and companies would be foolish not to do what they can to fix what goes wrong. I am glad you spoke up but your voice gives you access that others lack. There is also a very good chance that many of the Delta large RJ routes from LAX will be C series routes in just over a year from now in addition to giving Delta the ability to add markets that won’t be profitable with any other existing aircraft. Tim – Not sure about American’s regional partners. American mainline was horrendous but regional operations held up just fine. MC – Compass isn’t over staffed and does not schedule the planes. American and Delta tell Compass when and where they will fly and they do it. It’s simply the way Mainline carriers use the limited space in LAX. Each airline has their fair share of company induced issues. But LAX is a very unique beast. The operations and logistics at the airport tend to be the smoking gun. This is why I really hate going through LAX. It always seems to be a cluster. The only place worse are the NYC airports. I’m a little surprised that you got 2 x $200 for your troubles. Delta lost my luggage for 5 days on a trip to Europe earlier this year. While they did reimburse me without hassle for my purchases (which in retrospect were very restrained and reasonable), I was only offered a $250 voucher as part of their apology. Your delay sounds frustrating and totally unnecessary, but not nearly as aggravating as five days in Paris without your clothes and being forced to change your vacation plans…. Sorry for your terrible experience. Had almost your same situation Monday on Frontier. My family and I were flying ORD-MCO. Plane came in from LAX about 2 hours before our schedule departure boarding time was 5:55am departure time was 6:30. 6:20 they get on the PA captain and crew are on the plane. The captain is talking to the crew and then they have to do a “security check”. So they finally board like 6:40. Get everyone on the plane as I was boarding some crazy lady was arguing and swearing because of her carry on cause she didn’t want to pay. Well let’s say she didn’t board out flight and was escorted by police. So we are waiting and waiting to push back. 7:21 I get a message our flight was going to depart at 7:20…..we’ll they are late. Captain gets on said they had to do wait for maintenance paperwork which we didn’t see anyone nor said what it was also some more fuel to fly around the storm that came by the area 4 hours ago. We finally pushed back made it to the end of the L concourse and waited another 10 minutes with no info on why. So finally got in the air about 7:40 with the detour looked like they took us to the Iowa Missouri boarder then southwest from there. Got in a little over an hour late. Ha, I was sitting in that same area a couple days before you waiting for my mainline Delta plane…which was late due entirely to ground operations. Had landed in from SLC on time but sat out on the tarmac somewhere for almost an hour before they logjam cleared and they could deplane. Not sure if it’s a LAX issue, Terminal 5 issue or what, but there are big problems with what they are doing right now. Not to excuse your experience of course. I’d fly into John Wayne if it weren’t for the prices being 2x higher than LAX for 1/3 the flight options. I will say that DL does an absolute superb job at their hubs, regionals included, but going into places like LAX, ORD, LGA is just always a hassle one way or another. We’ve experienced about the same on our flight to Bali with a transit in Dubai. In the end the trip took us nearly 40 hours! Joy, joy! I can hardly wait until all the airlines have all of there flight operated by someone else. everthing done by someone else..
Don’t blame me, that was our DBA operator. Bags? Don’t blame me, that was our contract ground handler. ATC? Don’t blame me, that was our contract ATC operator. Customer service?. Don’t blame me, that was our, who was it, don’t tell me, oh yes, I think we farmed that out to K-Mart! But, Hey! Revenues have never been better. Profits, off the chart. Our refinery, don’t you worry about it! Surprised that the crew did not time out with this long delay. I have noticed on multiple occasions with AA in Miami that if a flight is delayed by more than 90 minutes, they either don’t fly or another crew is brought in resulting in an even further delay. One caveat is that most of these flights are departing International to South America. This results in the flight being delayed until the next morning, passengers being sent to hotels, given transportation, food, and drink vouchers, and an additional hassle of going through TSA a second time. So, you booked a 2:40pm flight to PHX because you wanted to “enjoy a little afternoon pool time before dinner.” Well, as another has posted, when absolute satisfaction rests upon arrival at certain time of day, then you should have departed day earlier or booked morning flight — Inconvenient? Yes, but absolutely necessary. In addition, it behooves me that you were aware airplane was downgraded and therefore solicitation for volunteers would continue – and involuntary was possibility, yet you made decision to arrive at airport one hour prior to departure. Seems to me, to allow time for unforeseen and uncontrollable events, i.e., traffic, security, etc, you should have been there no later than two hours before to prevent involuntary denial. Yet I am glad you did not face this unfortunate situation, but if you had, it would have been your own fault. Still can’t figure out why, at gate, you continued to check updates on mobile device – that is, considering gate agent and crew were diligent informing? Yes, to pass time, you can check device updates, however, don’t complain about the lag in update – especially when you are in position and receiving real-time status. WHEW! The airplane had maintenance, obviously. Seems to me inconvenience(s) took place transitioning the equipment back into service – and each was reasonable. Inconvenient? Yes, but unreasonable, absolutely not! Further, you had to check your bag, taxied 24 minutes before take-off and held for 15 minutes at ballpark, and you continue to complain, endlessly. As I’ve written before, you require waaayyy toooo much. Life must be good, bro!